Almost 60% of our muscles are made up of L-glutamine. This is clearly such an important amino acid in our bodies. Glutamine makes sure that you can perform during hard workouts, or whenever your everyday life gets a bit intense. No, capsules don’t have to be made from processedslaughterhouse waste. Everything in our BCAA Capsules is plant-based, and ourcapsules are 100% vegan. What are they made of? Only cellulose fibers fromnatural, renewable raw materials. Some glutamine products are extracted from low-grade sourceslike human hair or duck feathers. But your body deserves high-quality supplementsthat ensure maximized performance. That's why our L-glutamine is naturallyfermented. We place great value on plant-based raw materials and use fermentedcorn to produce our L-glutamine. Using 100% vegan processes, we createhigh-quality amino acids with excellent bioavailability. Our L-glutamine. In a class of its own. Take 4 capsules post-workout with plenty of fluids. Take 4 capsules a day if you exercise more than 3 times a week. Since stress exhausts your glutamine stores more quickly, takingadditional glutamine is not only a good idea for workouts. It will also help tocounteract symptoms of stress. I´m taking glutamin and creatin and I think this is perfect for muscle building. Feels good. Since I have been taking l-glutamin I have more power. Great product. Quick delivery. Top quality. I am impressed by the service and advice I have received. Can't say anything about the results yet, but I have a good feeling. A friend recommended this to me. It is perfect to take after the workout and also prevents sore muscles. Absolutely satisfied. L-glutamine is one of the most popular supplements in the world of fitness. This versatile amino acid plays a part in the synthesis of protein compounds in the body and is of primary importance to the muscle cells. L-glutamine is also involved in the formation of the antioxidant glutathione. Glutathione protects the cells from oxidative stress and supports the regulation of the acid-base balance. Since L-glutamine also enables the formation of the natural antioxidant glutathione, it protects all cells against oxidative radicals. The quality of the raw materials used for L-glutamine and the product value can vary significantly. The amino acid is often extracted from human hair or duck feathers. The higher quality version with significantly higher bioavailability and biocompatibility is found in fermented L-glutamine derived from plant sources like corn or sugar cane molasses. Although the body can produce L-glutamine, a deficit often arises as a result of physical exertion like in functional training, running and other types of activity and this deficit needs to be compensated. A deficit causes the body to use stored amino acid elements to produce its own L-glutamine. These amino acids will then be missing for muscle building or worse: the body’s own store of protein will be used for the process. The muscles will not be able to receive nutrients during that time. An additional intake of L-glutamine counteracts this process. L-glutamine is a proteinogenic amino acid. It is directly involved in the synthesis of a number of proteinaceous substances. L-glutamine is also involved in a number of other processes in the body. The highest concentration of this amino acid can be found in the muscle cells, which is why it is so important for endurance training. L-glutamine causes water to accumulate in the cells and ultimately leads to an increase in cell volume. The increase in cell volume and muscle profile is essential for the adaptation of the muscle tissue. This improves glycogen storage in the muscles. That is how L-glutamine improves regeneration overnight. Since all athletes require additional glutamine, it is worth considering supplementation. Glutamine supplements are a great way to fill the body's glutamine stores and to prevent undesirable processes where possible. Glutamine is worthwhile for anyone who exercises regularly. Since L-glutamine significantly improves regeneration it is ideal for the recovery period after exercise. L-glutamine capsules should be taken just before or right after training. That is when the body is in need of replenishment and the glutamine supplement can work to full effect. It will prevent your body having to draw on its internal reserves. We recommend a morning dose on non-training days for athletes who train more than three days a week. Glutamine is available either as a powder or in capsules. How you wish to take L-glutamine depends on your personal preferences. The following is an overview of the advantages and disadvantages of both forms. 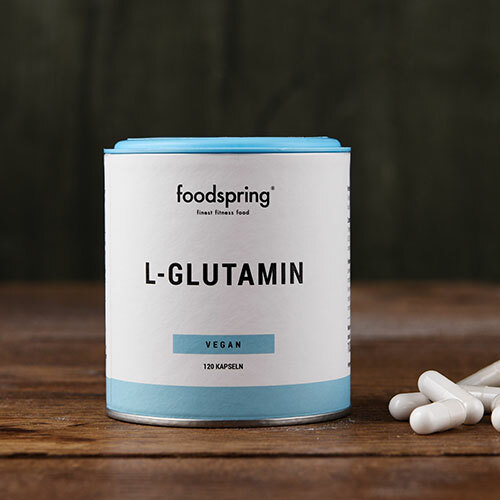 L-glutamine capsules are practical and easy to regulate in terms of dosage. In practical pill form, the dosage can be accurately determined and taken to the gym. A slight overdose of glutamine does not harm the body, but also doesn't benefit it. The disadvantage of glutamine capsules is that they are usually more expensive than L-glutamine powder, because the powder also needs to be filled into capsules. The idea that the body absorbs glutamine capsules less efficiently than powder is simply a myth. L-glutamine capsules are equally well absorbed by the body as glutamine powder. The advantage of glutamine powder is the price. And athletes who have problems swallowing tablets may also want to consider powder instead of capsules. The powder can easily be dissolved in water or a protein shake. The disadvantage of glutamine powder: It is difficult to get the exact daily dosage of 3 - 10 grams right. You may end up taking too much or too little glutamine. L-glutamine is also found in many foods. Quark is particularly popular in the world of bodybuilding, as are peanuts, soya and wheat. Since meat naturally contains a lot of protein it also contributes to your L-glutamine supply. If you follow the recommended daily there is no risk of side effects with L-glutamine. An overdose can cause headaches accompanied by nausea and hot flushes. When buying glutamine you should be mindful of the quality of the product. A low price may be an indication that the glutamine powder contains cheap additives. The glutamine is often extracted from inferior raw materials like human hair or duck feathers. These deficiencies in the quality and production manifest themselves through a bad taste and diminished efficacy. High-quality glutamine supplements come from fermented raw materials of plant origin like corn or sugar cane molasses. Then there is glutamine peptide. This is L-glutamine bonded with another amino acid, like alanine. This can be absorbed by the body even more efficiently. However, this combination contains far less glutamine than pure capsules or powder and is far more expensive. That's why we recommend a pure glutamine supplement combined with a protein shake. What are the advantages of plant-based glutamine? We only use plant-based ingredients to produce both the contents of our Glutamine as well as the exterior capsule shell. That’s how we can offer 100% vegan quality and maximum organic value. Do you use human hair in your L-glutamine? We strongly oppose inferior extraction methods that involve human hair or duck feathers. While this process might be cheaper, it’s just not compatible with our high quality standards. We want vegetarians and vegans to benefit from high-quality L-glutamine, which is why we use plant-based raw materials for both the capsule and what’s inside it. And honestly, who wants to take dietary supplements that contain human hair, duck feathers, or slaughterhouse waste products? Not us. Can women also take L-glutamine? All muscles consist of 60% L-glutamine. It’s essential for both men and women to get enough of this amino acid. Your body does produce its own, but athletes require more to perform at their best. If your body doesn’t have access to enough L-glutamine, your recover period will be longer than average. Doesn’t matter what gender you are. Which sports is L-glutamine useful for? L-glutamine helps the body to recover rapidly from either endurance or team sports. L-glutamine can also benefit anyone who exercises regularly. L-Glutamine will be back in stock shortly.